To extend students’ understanding of Christianity and at least two other religions, alongside humanist and atheist ideas in a local, national and global context. To enable students to gain an understanding of the meaning of Religion, and to reflect upon the contribution of Religion to a community’s culture. To explore the ideas that different religious traditions have about God, the world and their place in it. To develop students understanding of key word and themes in religion. 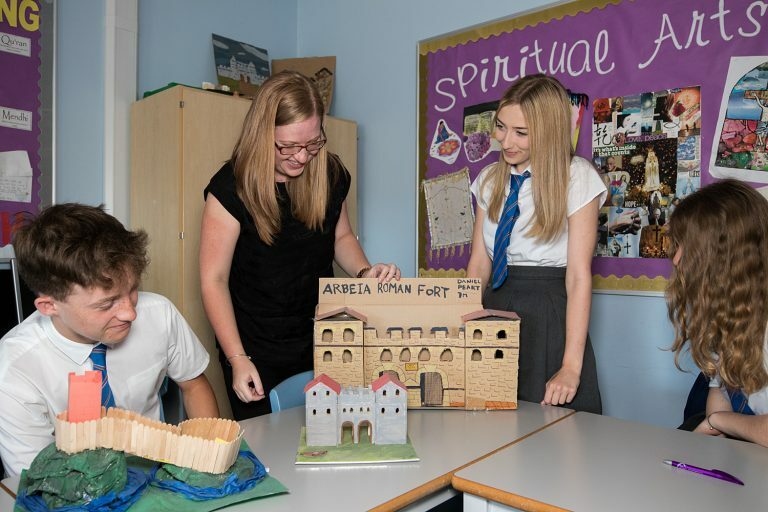 Students will develop their knowledge of religion through different themes such as why some people believe in God and how religions celebrate rite of passage. Set every other week, for example complete a religious collage, design a superhero and design a boardgame for rites of passage. To extend students’ understanding of Christianity and at least two other religions, alongside humanist and atheist ideas in a local, national and global context. To enable students to gain an understanding of the meaning of Religion, and to reflect upon the contribution of Religion to a community’s culture. To explore the ideas that different religious traditions and how they impact upon believer lives. To develop the skills and knowledge that students will need to complete extended answers. Students will continue to develop their knowledge of religion and the course will study topics such as: – what does it mean to be a Muslim and whether differences within religion matter, as well as making links between the beliefs of different religions such as Christianity, Islam and Judaism. Set every other week for example: Five Pillars meanings, design a prayer mat, synagogue research and revision sheets. To enable students to apply their understanding of religious and philosophical beliefs, teaching and practices to a range of different contexts. There is a focus on self-awareness, sources of wisdom and authority and ultimate questions and ethical issues. Students are given the opportunity to develop a range of skills to help them develop their evaluation skills as well as their ability to develop reasoned and balanced viewpoints when considering their own and other’s responses to religious, philosophical and ethical issues. The focus is on spiritual arts based on a range of religious beliefs including Buddhism and Hinduism. Students will focus on philosophical issues such as life after death and evil and suffering in a unit of work on ultimate questions. Homework set once a week: key word sheets, Prince Siddartha storyboard, story of Job newspaper. To ancourage students to develop their own informed opinion. Students will learn about Christian and Muslim beliefs which inform how they live their lives, they will also be able to study Humanist and Atheist beliefs on each issue. Student will gain knowledge and understanding of life issues and how Christians and Muslims respond to living in a modern, ethnically diverse, multi faith society. Students will be able to construct reasoned responses to religious, ethical and philosophical issues which use sources of wisdom and authority to develop answers and make reasoned judgements. Christian beliefs, marriage and the family, Muslim beliefs and crime and punishment, also matters of life and death. Issues such as divorce, the role of women, the death penalty and abortion are covered. Parents/Carers have the right to withdraw their children from Religious Education, either wholly or in part. Parents are free to exercise this right and Huntcliff School with give effect to such requests. Parents are not obliged to state their reasons for seeking withdrawal, however we would advise parents to do so. It is the duty of the school to support community cohesion and Religious Education lessons play an important role in this. Parents do not have the right to request that work in another subject be completed in place of Religious Education, therefore additional teaching for other subjects will not be provided during this time. Huntcliff School will supervise student’s when required and ensure that any entitlement does not negatively impact on their attendance or the ethos of the school.